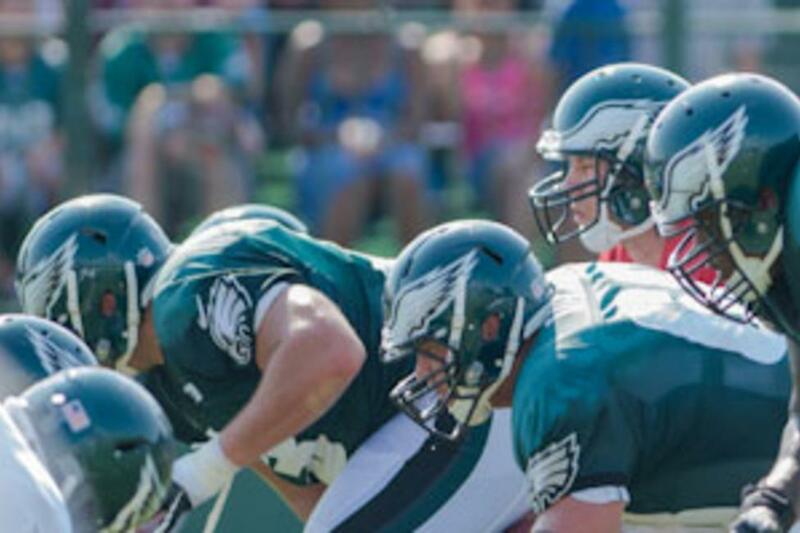 Last week I took my annual visit to Lehigh University to check out Philadelphia Eagles’ training camp which runs through August 14. This year I brought along my uncle, Hank, and his life-long friend, Roy, who are owners in our fantasy football league. I tied our trip to training camp and a much deserved lunch at P.J. Whelihan’s, as their reward for helping me with a furniture move. The food and atmosphere at P.J.’s was as good as advertised. Cold beer, juicy burgers and more TV’s than you can count, helped bide our time till the afternoon training camp session started. The team has switched practice programs this summer to include shorts and pads in their morning sessions; and full pads and contact in the afternoon session during the heat of the day. I assume this will help with those late summer games with 4 o’clock start times. As we arrived at Goodman Campus at Lehigh University, both Hank and Roy could not believe the amount of people who took the pilgrimage to see their beloved Eagles stretch and play catch. With close to 5000 in attendance on this Friday, it is clear that training camp has become a big part of the Eagles’ brand. A giant tent filled with merchandise for kids, women and of course men greets you as you enter the practice field. Admission to training camp is free and the Eagles charge a nominal fee to enter the KidsZone, a fun NFL experience type setting where kids can run, jump, kick and throw like a Pro. Excellent seating is available with grandstands surrounding the training complex. We caught special teams on a satellite field before heading over to the main field. Sitting across from the East grandstand, offered us excellent view of 7 on 7 passing drills. This lasted about 90 minutes and by 4:30 we had had our sun quota for the day. The facility has zero shade, so bring the sunscreen and dress light. I have made the mistake in the past of sneaking out before work or after lunch in slacks. This is not advised. I highly recommend getting your fantasy team owners together for a trip to the Lehigh Valley. Couple training camp with great golf, brew pubs, grand prix style cart racing and a full-service casino this can make for a great vacation.